Car Parking for over 2,000 cars is provided. The positions of the car parks are completely different from previous years. Please take careful note of the map and select your car park before setting out. A one way system will be in place and signs will direct you to either the Upper, West Car Park or the Lower, East Car Park..
A small car parking charge of £5.00 covers costs of providing parking and includes a free programme. Disabled Parking (subject to availability) and “drop off” are also provided. 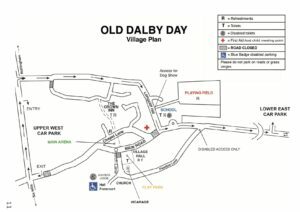 Disabled car parking, for badge holders only, is in the grounds of Old Dalby Hall. Please follow clear signs. Important… Blue Badge holders will need to approach from Nottingham Lane, down Longcliff Hill, Station Road and right intoParadise Lane. Access via Station Road from the west side, near Queensway not possible due to one way system in place to protect pedestrians. See map above.